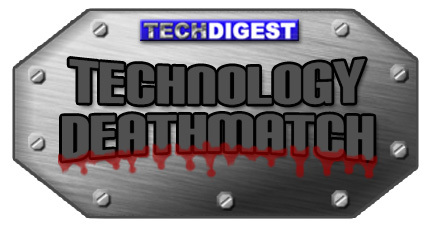 Not your traditional Technology Deathmatch today but when I saw this post on Wired last week my hackles were raised to the point of crowbaring the issue into my regular Monday feature and, well, here we are – cameraphones: should they have to make a sound when the shutter is released, or shouldn’t they? With Mobile World Congress 2009 just around the corner, it’s very easy to get caught up in all the new, exciting and utterly misjudged handsets the manufacturers are set to unveil. But before you dive in to pick up your phone I urge you to take your time deciding which network you choose to subscribe to. After all, what use id your iPhone 3G if there’s only GPRS coverage down your road? Good afternoon grappling fans. It’s taken an extra week to have the broken glass elements swept up and the ring re-sprung after the inaugural clash two weeks ago between Nikon and Canon, but floor -32 of the sub-sub-basement of Shiny Towers is open once again for the bloodiest match-up in the world of the chipset smack down – Technology Deathmatch. There’s a chill in the mouldy air today. It’s two-for-one day in the arena with many of the rich, foreign businessmen abroad or in offices with their accountants assessing the damage to their stocks. With cheap entry comes the cheap crowd: Guinness soaked mothers with their screaming children, gangs of late thirty-something woman waiting for Mecca Bingo halls to open and sacked City traders at the glass-stained ends of long, empty whiskey bottles just looking for a way to forget. They cry blood, they scream, “entertain us” and that’s exactly what they’ll get in the ‘Battle of the Mobile VoIPs’. Telecommunication giants were twitching but now it’s the mobile operators that are all a mutter with the rise of new ways to bypass their networks. There are many companies jumping in as mobile middlemen but today going toe to toe are two very different contenders.